Lactating adenomas of the breast typically present during periods of pregnancy and lactation as palpable, well-circumscribed, lobulated masses which may wax and wane in size. While the sudden appearance of a breast lump may be alarming to the patient, lactating adenomas have no malignant potential, and they often regress spontaneously. Nonetheless, a thorough workup would involve the triple assessment, comprising clinical, radiological, and pathological evaluation. As part of the pathological evaluation, solid areas may be subjected to tissue core biopsy, and cystic areas may aspirate for fluid cytology. The surgical pathologist needs to be familiar with the epithelial changes of the breast terminal duct lobular unit (TDLU) that may occur during pregnancy and lactation, so as to avoid erroneously interpreting benign lactational changes as malignant on small biopsy or cytology samples. A 35-year-old Chinese woman, 1-month postpartum, presented with a nonenlarging right breast lump of 6 months' duration. She had been breastfeeding uneventfully for the past 1 month, was not on any long-term medications, and had no other significant past medical history. The patient's paternal grandmother had a history of breast cancer, which was diagnosed in her 40s. Clinical examination revealed a well-circumscribed, soft, and mobile mass measuring approximately 2.5 cm in size on the right breast at the 6–7 o'clock position. On bedside ultrasonography, the lesion was noted to have solid and cystic components. A subsequent more detailed ultrasonography scan revealed the lesion to be a lobulated heterogeneous solid-cystic nodule, which measured 3.3 cm × 2.0 cm in size, with ill-defined borders in some areas [Figure 1]. The cystic component was aspirated for fluid cytology, and the remaining solid component was biopsied for histological evaluation. Fluid cytology [Figure 2] demonstrates numerous scattered cyst macrophages as well as a granular foamy background consisting of cell cytoplasm fragments and lipid. While overall cellularity is low, there are single-occurring and loosely cohesive clusters of ductal epithelial cells with ample vacuolated cytoplasm, enlarged hyperchromatic eccentric angulated nuclei, visible nucleoli, and coarsely clumped chromatin. Occasional bare nuclei are present in the background. No stromal fragments are identified. Core biopsy [Figure 3] mainly demonstrates a benign fibroepithelial lesion with pericanalicular and intracanalicular architectures. In addition, there is an area with lobular expansion of the native breast parenchyma. In this area, there are crowded, back-to-back acini, but there is otherwise overall preservation of the lobular architecture. The epithelial cells lining the acini have ample clear multivacuolated cytoplasm and enlarged hyperchromatic nuclei. Prominent nuclear hobnailing of the epithelial cells is also identified. Triple assessment of the breast lump concluded it to be a benign lactating adenoma/fibroadenoma with lactating change. The patient was given appropriate reassurance and managed conservatively. Lactating adenoma typically develops during, or shortly after, pregnancy. In general, untreated lactating adenomas undergo spontaneous regression following the end of pregnancy or lactation. While it mostly occurs in the breasts, it may also occur in ectopic breast tissue along the milk line. It is unclear if lactating adenoma represents a specific neoplasm, if it represents nodules of physiologic lobular proliferation that become more prominent than the adjacent breast parenchyma and is clinically evident as a distinct mass, or if it is simply a result of hormone-induced changes occurring within a preexisting fibroadenoma/tubular adenoma during pregnancy.,, Regardless of its etiology, there are diagnostic challenges to be considered. 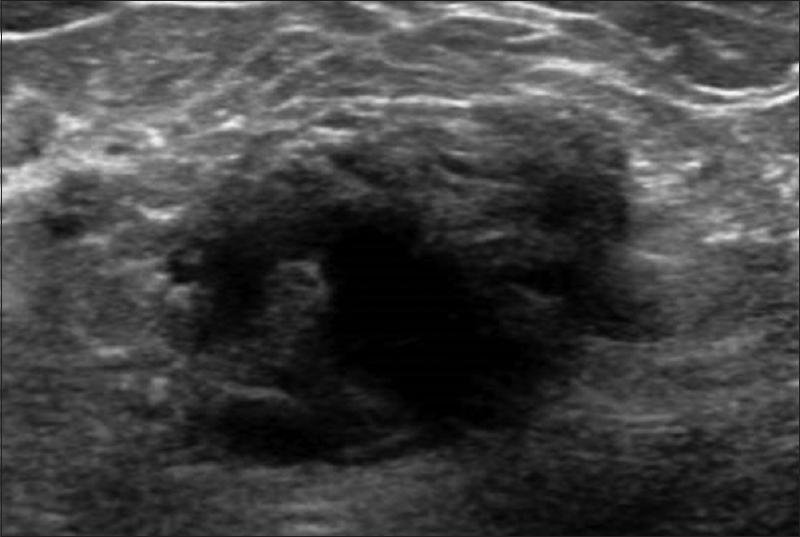 Owing to the native breast parenchyma's florid lobular growth, fibroadipose stromal involution, and increased glandular vascularity during pregnancy, a breast lump may not be well elucidated on clinical examination and imaging., In addition, fine needle aspiration cytology may be misled by the hormone-related effects on the TDLU epithelium. These hormone-related effects result in the physiological proliferation of acinar cells with enlarged nuclei, prominent nucleoli, and ample amounts of clear vacuolated cytoplasm. Their cytoplasm, being fragile, is often stripped away during the preparation of the cytology specimen, leaving behind a mixture of mainly single-occurring intact epithelial cells and bare nuclei within background granular vacuolated debris. 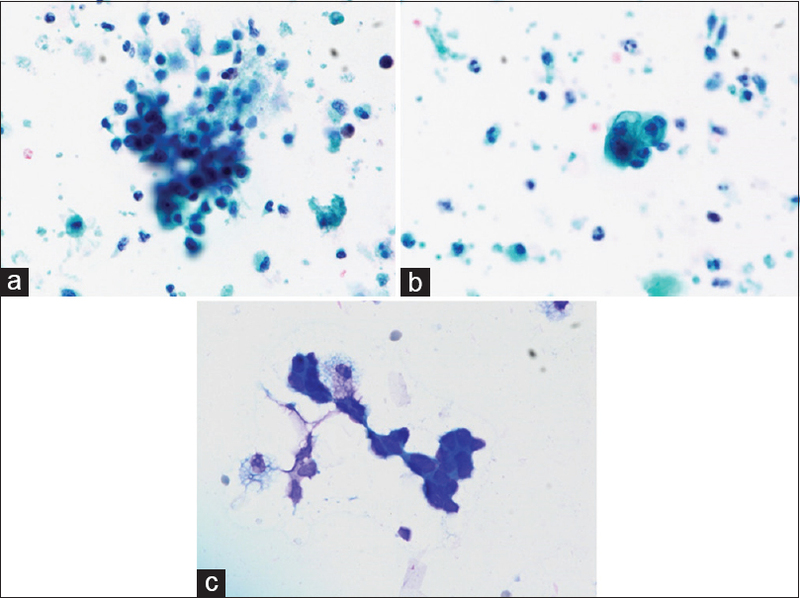 Taken out of its clinical context and if the granular foamy background was to be ignored, the fluid cytology of this case might have been interpreted as atypical or suspicious for malignancy. Fortunately, the detailed clinical information given in the requisition form, and the accompanying core biopsy of the solid component, allowed for proper clinical-pathological as well as cytological-histological correlations. Lactating adenoma is a diagnostic pitfall on aspiration cytology. Without careful consideration of the clinical history and the granular vacuolated cytology background, one may be misled by the presence of numerous single-occurring ductal epithelial cells with enlarged nuclei and prominent nucleoli, which mimics adenocarcinoma. An erroneous diagnosis of malignancy would result in unnecessary anxiety and surgical intervention for the patient. Faguy K. Breast disorders in pregnant and lactating women. Radiol Technol 2015;86:419M-38M. Barco Nebreda I, Vidal MC, Fraile M, Canales L, González C, Giménez N, et al. Lactating adenoma of the breast. J Hum Lact 2016;32:559-62. O'Hara MF, Page DL. Adenomas of the breast and ectopic breast under lactational influences. Hum Pathol 1985;16:707-12. Slavin JL, Billson VR, Ostor AG. Nodular breast lesions during pregnancy and lactation. Histopathology 1993;22:481-5. Son EJ, Oh KK, Kim EK. Pregnancy-associated breast disease: Radiologic features and diagnostic dilemmas. Yonsei Med J 2006;47:34-42. Vashi R, Hooley R, Butler R, Geisel J, Philpotts L. Breast imaging of the pregnant and lactating patient: Physiologic changes and common benign entities. AJR Am J Roentgenol 2013;200:329-36. Gray W, Kocjan G. Diagnostic Cytopathology. Edinburgh: Churchill Livingstone/Elsevier; 2010. p. 195. Grenko RT, Lee KP, Lee KR. Fine needle aspiration cytology of lactating adenoma of the breast. A comparative light microscopic and morphometric study. Acta Cytol 1990;34:21-6. Shin SJ, Rosen PP. Pregnancy-like (pseudolactational) hyperplasia: A primary diagnosis in mammographically detected lesions of the breast and its relationship to cystic hypersecretory hyperplasia. Am J Surg Pathol 2000;24:1670-4. Koktener A, Cakir B, Akin K, Kosehan D, Bayrak R, Yenidunya S, et al. Pregnancy-like (pseudolactational) hyperplasia: Uncommon cause of microcalcifications and mass in two cases. JBR-BTR 2013;96:25-6.